Gitmo must be closed and its prisoners either released or tried in a real court of law. Guantanamo-the-prison has been a lawless place from the day it opened: January 11, 2002. Indeed, the Bush administration wanted it that way—with the freedom to interrogate prisoners from Afghanistan and Pakistan (most bounty-purchased from their captors) beyond the reach of American justice and the probing eyes and ears of journalists. At its zenith, “Gitmo” held 780 prisoners. Some 70 percent of them were released by transfer or federal court trials during the Bush years. When President Obama took office in 2009, there were 242 “detainees.” Transfers to other countries, trials (by federal courts and military commissions) and prisoner deaths (4), have whittled that number down to 91. Thirty-seven of those men have been cleared for release (24 of them still waiting to be freed six years after their interagency clearance). Of the remaining 54 prisoners, ten face trials or trial outcomes. The rest are awaiting Periodic Review Boards or PRB decisions. Thus the Guantanamo population could drop to a dozen or fewer prisoners by the end of the year. Given the Gitmo’s documented operating cost of $445 million in 2015, the annual cost would rise to an astronomical $37 million prisoner. By contrast, one prisoner year in a U.S. Supermax prison costs about $78,000. Will American taxpayers and their parsimonious representatives in Congress agree to bankroll a continuing Guantanamo raid on the treasury? Beyond the issue of fiscal responsibility are seven questions below for President Obama during his last 300 days in office. Why the delay in releasing prisoners who present no security risk? In a January 2, 2016 editorial, The New York Times blamed it on the Defense Department “where officials have used every bureaucratic trick in the book to slow down the release of inmates.” The President should no longer tolerate such insubordination. If Guantanamo is not to be his lasting legacy, the PRB process and transfers of cleared prisoners must proceed more quickly. 2. Why the labeling of some prisoners as “too dangerous to transfer, but not feasible for prosecution? In a lawful society, such labeling would be out of order, for such a nation would never condone indefinite detention. Prisoners “too dangerous to transfer” must be tried in a federal court in the United States. Why the continued and secret force-feeding of hunger strikers? In his May 23, 2013 speech at the National Defense University, President Obama questioned force-feeding. “Is this who we are?” he asked. Yet the President failed to stop the practice and even allowed the Defense Department to discontinue advising the press on the number of hunger strikers. Later his Justice Department stonewalled the Federal court-ordered release of videos of the procedure. Force-feeding is generally regarded as torture and should be treated as such by the U.S.
Why no accountability for those who tortured or authorized torture? Without such accountability, torture practices are likely to return. Indeed, the recent bombings in Europe have stirred some Republican candidates to advocate harsh interrogation and waterboarding. Why has the UN torture envoy repeatedly been refused access to Guantanamo and other prisons? According to a March 8, 2016 story in the The New York Times, Juan Mendez, the United Nations special rapporteur on torture told the UN Human Rights Council: “My request to visit the United States of America has been pending for five years over the terms of reference in order to obtain access to all places of detention.” Denying access to a UN investigator suggests that the U.S. has something to hide; it also weakens America’s human rights efforts to uncover torture in other countries. Why the continuing imprisonment of the seriously malnourished prisoner Tariq Ba Odah (on hunger strike for almost nine years), Gitmo’s oldest prisoner Saifullah Paracha (suffering from a serious heart ailment and diabetes); and Guantanamo Diary author Mohamedou Ould Slahi? Odah, reported to be “near death” at half his normal body weight, was cleared by 2009-2010 task force, but remains imprisoned. Paracha, 68 years old, has an exemplary 13-year prison record, but his prospects for release are uncertain. Not even his lawyer can say why Slahi is still being held, though he now has a PRB hearing scheduled for June 7, 2016. Was he was being punished for his book’s disclosure of torture? Why not close Guantanamo now? Despite the high legislative hurdles imposed by a Republican Congress, the President could and should use his executive authority as commander in chief to close this shameful symbol of American lawlessness. 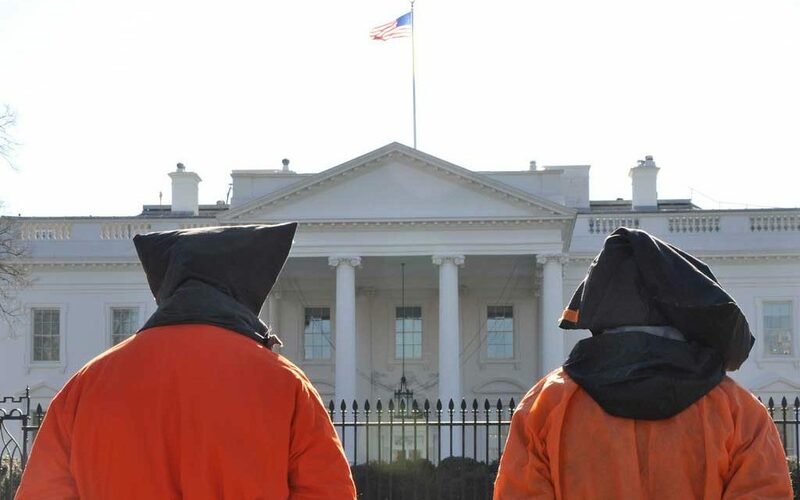 Guantanamo was a mistake, not as big as the Iraq invasion/occupation, but big enough to blacken America’s image as a lawful society and erode its own respect for the rule of law. Gitmo must be closed and its prisoners either released or tried in a real court of law.